With all the features of the LP180 and the addition of a built-in radio receiver, the LP180R is the next step for photographers looking to extend their OCF reach. With four different wireless modes, the LP180R gives you the versatility you need. Used Vivitar Pistol Grip PG/2 for off camera flash use. In very good condition. Grip opens at the bottom for extra battery or battery pack storage (see photos), side strap, rotating flash shoe mount, release button for 2 position camera mount bar and opening for shutter release cable on handle. Flash can be completely removed from the camera mount bar (release button) and bar itself can be attached to a tripod mount separately. Will ship USPS Priority Mail (US only). International buyers need to request shipping costs before bidding or buying. Additional flash accessories will be list as soon as available. Canon Speedlite 600EX II-RT Shoe Mount Flash for Canon With Off Camera Shoe Cord. Condition is Used. Shipped with USPS Priority Mail. Professionally used speedlite. Never dropped and has signs of normal use with very light surface wear. Clear diffuser has surface wear. (Condition is New in box. Shutter Sync mode: rear-curtain, high speed sync (HSS/FP), Max 1/8000s sync speed. FEB flash, E-compensation, Auto Exposure Lock(FEL/FV). 180mm focal length, ISO 100); Flash Coverage: 18-180mm. Compatibility with all Profoto AirTTL Remotes, including A1. Profoto knows that size matters for photographers. Because how much gear they have to carry matters. That’s why when Profoto set out to create the B10 they first considered size. Canon 380EX Speedlite E-TTL Flash. Free and Fast Shipping! Brand New! Box dent on the front side-NEW NEVER BEEN USED. Godox AD-R6 169mm Approx 7" Standard Bowens Mount Reflector for Godox AD600BM AD600B. 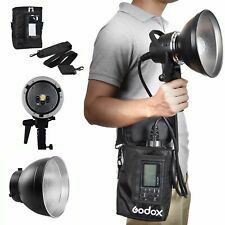 Godox PB-600 Portable Flash Bag Case Pouch Cover for Godox Witstro AD600 AD600B AD600M AD600BM. Godox AD-H600 Bowens Mount for AD600B Wireless Strobe Flash. Expert Service. Unbeatable Price. Coiled cord. Provides flexibility and convenience. Owner's manual. Cable Type: Curled. Cable Length: 8 feet. Color Category: Black. Godox AD-H600B Bowens Mount Head for Godox AD600B AD600BM Wireless Strobe Flash Style: H600B Bowen Mount | Product Packaging: StandardPackage Godox H600B Works With AD600B AD600BM Bowens Mount Flash Makes shooting more convenient. Godox AD-R6 Approx 7" Standard Bowens Mount Reflector for Godox AD600BM AD600B Brand: Godox Model: AD-R6 Color: Black Mounts: Bowens Material: Aluminum Diameter: 7" Godox PB-600 Portable Flash Bag Case Cover for Godox AD600 AD600B AD600M AD600BM . Stabilizer Steadycam. Flash Light. Follow Focus. 300WS 300W Pro Photography Studio Strobe Flash Light Lamp 9 Channel Remote. LED Video Light. Hot sale item. eCheque will be held until cleared. Two vivitar 285 hv flashes both in working order but one needs a replacement hotshoe that can be found on B&H photo for about $7. Comes with original boxes not seen in the photos. HAPPY BIDDING!!! THANK YOU!!! Flash is in good working condition. Batteries chamber is clean. Our products are quality assured! Most importantly, the cost for our products and services are set at reasonable prices! - Great experience. These are the following conditions that we do not cover. WHAT YOU SEE IS WHAT YOU GET. MY PHOTOS ARE THE ACTUAL PRODUCT. Trending at $28.38eBay determines this price through a machine learned model of the product's sale prices within the last 90 days. This is the world famous Vivitar 283 Auto Thyristor Flash. It will bounce and has thyristor circuitry for fast recycling. This unit is in EXCELLENT Condition and works perfectly. Unit has been tested and is in working condition. Includes carrying case and cord. Batteries not included. A few normal outward signs of usage, no batteries or accessories. New old stock from a now defunct photography store. Open box. I opened it for pictures. Canadians, we can ship Canada Post. Please contact us for rates. Pictures are of actual item you will receive. Thyristor uses 2 AA batteries. We are only capable of plugging an item in to see whether it power's or not. WE DO WORK DILIGENTLY TO ATTEMPT TO GET AS MANY OUT AS POSSIBLE SO THERE ARE NO DELAY'S IN YOUR ORDER. Like new condition Cord only Manual is not included. If interested is posted at separate item. Vivitar Auto Thyristor Extension Cable for model 283 Pigtail off of Camera Cord. See the pictures for the actual item. Flash AD360 Godox AD-S17 180 Degrees Wide Angle Soft Focus Shade Diffuser for Speedlite Flash AD360. TT685N TTL Wireless Remote Flash Trigger for NIKON Godox AD-S15 Flash Lamp Tube Bulb Protective Cover for WITSTRO. 200W Flash Head, especially design for Godox AD200 speedlite. Fully compatible with AD200 bare bulbs head and speedlite head functions. 1 EC200 portable flash light lamp head. Stabilizer Steadycam. Adapter & Macro Tube. With built-in Godox 2.4G wireless X system, V850II is compatible with AD600, AD360II-C, AD360II-N, TT685C, TT685N, X1T-C, X1T-N, etc. In the 2.4G wireless transmission mode, when used as a master unit, V850II can set its group as M/A/B/C/D/E; when used as a slave unit, V850II can set its group as A/B/C/D/E. Tilts 90-degrees for variable bounce, has auto shut-off, manual power-off & power-on buttons, ready light, test button, exposure scale. Tests OK, requires four AA batteries, not included. Made in Japan. Also allows for Remote Triggering of the flash. ◈ Hair Care & Styling. ◈ Shaving & Hair Removal. ♢ RG316 Coaxial Cable. ♢ Flash & Lighting Accessories. ♢ Flash & Lighting. ♢ Flash Adapter. Model : OC-E3. Suit for the speedlite for Canon with TTL function??. Attach the hotshoe end A of TTL cord to the speedlite hotshoe. This item only includes the??. Cable stretched length: Up to 150cm / 4.92ft. We check to be sure all optics have no problems that would noticeably affect image quality, unless we describe them otherwise. We try and list all pertinent faults. PRESENTA 930 VC Auto Off Flash. Working Condition : PERFECT Fires as new without problems. I give your money back if it is not as described. Trending at $30.91eBay determines this price through a machine learned model of the product's sale prices within the last 90 days.